It was a long time coming, but Isaiah Thomas finally got the warm welcome he deserved from the Boston Celtics. 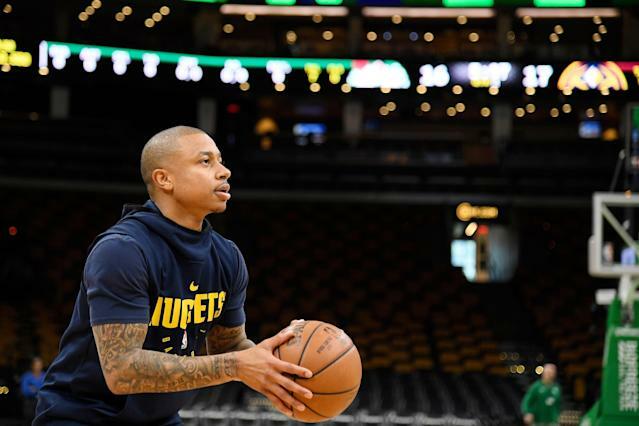 Nearly a year and a half after his fateful trade to the Cleveland Cavaliers for Kyrie Irving, Thomas got to play his former team at the TD Garden for the first time on Monday. And before the opening tip, the crowd greeted him with a raucous ovation. This was actually the second time that Thomas visited the Celtics since the trade, although he was inactive and recovering from a hip injury last January. Thomas made the trip but requested that the team not make him a tribute video since his family wouldn’t be there to watch him play. But despite the heartbreak of the trade — and the lack of a lucrative contract that he likely would have received had the Celtics not added Irving — Thomas has nothing but love for the city that embraced him. Even if he only played 179 games with the Celtics, Thomas’ candle burned bright with near-rock star popularity. Thomas made a pair of All-Star teams and averaged 28.9 points per game in the 2016-17 season, finishing fifth in MVP voting. Thomas was held scoreless over seven minutes in the Nuggets’ 114-105 win, as he came appeared late in the first quarter but did not get any more burn after being pulled in the second quarter. He was 0-for-2 from the field but picked up a pair of assists.